Thanks to Snapchat, vertical video is now how young people—and thus, ad people—do mobile video. But there are always moments in a trend when an advertiser doesn't just follow along, but breaks it down and uses the mechanics to meet its own ends. This is one of those times. 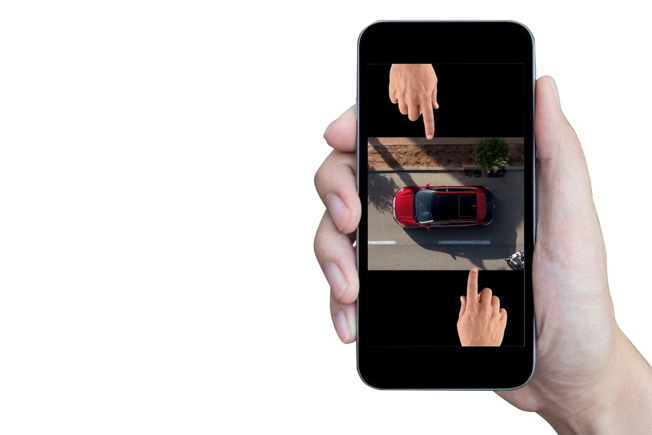 To promote the Ford Edge's Blind Spot Information System [BLIS], BBR Saatchi & Saatchi in Israel created a mobile ad that, like Geico's unskippable ads for preroll, might change how other advertisers see vertical video. The mobile ad appeared on Facebook and features a car driving down a road, right between the black bars that frame horizontal videos viewed vertically—playing to people who can no longer be bothered to turn their phones sideways. It then asks, "Want to see what's in your blind spot?" Two fingers reach out and pull the black bars away, revealing a hidden motorcyclist right in blind spot territory. The ad does a nice job of using vertical video to explain what BLIS is—a feature that lets you see within your blind spots—without having to say much at all. Per BBR Saatchi & Saatchi, the post got over 600,000 views in just four days. Not bad for the work of a few seconds.